Former management consultants can make great CEOs and senior leaders. But success isn’t guaranteed and some mistakes must be avoided. Claire Harbour-Lyell and Antoine Tirard have collected a selection of cases studies to illustrate the challenges faced by management consultants. In another article, we also discuss what happens to your salary if you decide to stay or leave in consulting. Are you looking for a senior position? While former management consultants represent only 5% or so of CEO transitions over the past ten years across the world, evidence from a recent study by Spencer Stuart would suggest that consultants are more than worthy of consideration for a role at the top. It would seem that, once at the helm of an organization, they tend to improve the condition between twenty to thirty percentage points better than their non-consultant counterparts, whether the company was in crisis previously or not. This does not necessarily indicate that all consultants should transition to CEO, but it certainly makes it worth examining a variety of stories, to explore the characteristics that lead to this kind of shift, and to discover the factors for success or failure. In this article, we do exactly that, looking at the story of four very different characters, all of whom have been successful consultants, as well as highly effective leaders. Little had prepared Thomas Bittner for his transition into consulting, where he found himself a junior consultant at McKinsey, aged 30, having already operated as Sales Director, Finance Director and even member of the Executive Committee, in a French steel company for Northern Europe. This was a time when McKinsey was moving towards more work in implementation of strategy, and so Thomas was of great interest to them, having a strategic brain and a top MBA, as well as deep experience of a significant industry. Thomas asked himself repeatedly in the early months, “what on earth am I doing here?”, as he crunched numbers and carried out market analyses. However, as clients got to know of his existence, they started demanding to work with him, as he was the one who had real experience, as opposed to most of the other career consultants. The enjoyment he derived from challenging thinking and improving a lot of some of Europe’s and America’s greatest CEOs was tremendous, and he found it intellectually highly stimulating. However, he realized that it is easy to tell such leaders what to do, but far harder to make it happen. He was missing the implementation! So, influenced by the frequent calls of headhunters, who pointed out that five years of operations and five years of consulting was the “perfect storm” for another powerful change, Thomas decided to take up the challenge offered to him by one of his clients, Polychrome Corporation, whose CEO offered him the following comment for a month’s consideration: “If you are so damn smart, come and implement this strategy for me!” It took less than that time for Thomas to decide to accept the challenge, and he was delighted to return to a world of operations and implementation, as the VP for Europe of the company. He had also calculated that if you leave consulting before you have made it to Partner, you can be hired as a VP, but if you wait to leave until you have reached Partner status, you can only become a CEO, and there are far fewer opportunities for CEO roles floating around. Thomas wanted to become a CEO, and after effecting a total turnaround of the European operation over five years, his ambition became a reality, and he was appointed CEO, with a move to New York. The power relationships Thomas enjoyed in this role were of great excitement. Knowing that he could get the head of any significant investment bank to take his calls, or that he could chat with and influence a board member of any Fortune 100 company, was something he took great pride in, even though he recognizes that he missed the pure intellectual stimulation of consulting. He talks a great deal about how important it was to learn change management, and to deal with people, building coalitions, empowering individuals, leading by example, and communicating effectively. This challenge no doubt became the substitute for the missing intellectual side of things. After five years in New York, as CEO, Thomas and his family wished to return to Europe, having had a “great ride” across the Atlantic. It was relatively easy for him to find a new role as CEO, and he had a brush with posts at Arjo Wiggins and others, before accepting a place at one of the companies that eventually merged into steel giant ArcelorMittal in the early 2000s. This return to his first sector was a logical one, and he was able to combine the strategic vision with his leadership abilities, to aid a company in huge flux to remain at the top of its performance. At this point in his career, Thomas has chosen to live with a portfolio of activities. Upon “retiring” from CEO life a few years ago, he had the freedom, financially, to slip into golf and travel, but has instead chosen to combine teaching a self-crafted strategy course at business schools and inside corporations, with running an olive plantation, and acting as advisor to the Ashoka social entrepreneur network. He is firm in his belief that in this epoch, “there is no more retirement”, and continues to use his unique combination of skills to add value across the board. He describes his activity today as “tremendously exciting”, and perhaps sees a parallel between the change he has brought about in his own professional activity, and the change he managed in his earlier roles. While he recognizes that consulting taught him a sense of urgency, he knows very well that he needed to learn about how to enforce change on those who (typically) do not want it, and this was something he could only develop by the doing. His portfolio career allows many still to benefit from this balanced view, and we hope to continue to read and learn from him for many more years! Rupert Warburton’s transition out of consulting was an easy one. An Australian, in consulting “for the usual reasons, of variety, experience and interesting colleagues”, he had always wanted to make something for himself. The thrill of creating was very attractive to him, and he took the time he spent doing his MBA at INSEAD to reflect on his wish to create capital value. After a few more years of consulting in London, Rupert had become highly aware of the damaging lifestyle involved in his profession, and talks with lucidity about those colleagues “on their third wives, and travelling endlessly”. With ten years of consulting behind him, he decided to buy some time and money by accepting a role at HSBC, so as to be able to create a company of his own within a few years. He had become disenfranchised and bored with consulting and felt motivated by the possibility of controlling his own destiny while creating value. The difficulty for Rupert lay in actually realizing that he had made the decision and not yet acknowledging it. Once he did see it, however, it was “blindingly obvious”, and the only option was action. By the late 1990s, Rupert had started his first company, based around coffee. He has tirelessly reworked his business model and honed an organization with a turnover of several million, that serves and has served coffee, variously, to corporate employees, to passengers on British Airways, and to millions of others. What did he miss when he first left the consulting and finance world? “The regular paycheck, of course! But more significantly, the power and brains of a team.” Rupert now sees and admits that in those early years of entrepreneurial activity, he wasted a lot of time. He was indulging his desire for the freedom he had so sorely missed and could have done things faster and better if he had chosen to. The realization that time is money hit him later than it might have! Reflecting on the differences between the two worlds, Rupert is eloquent. He talks about how he hopes one day to hire more consultant types but sees the financial constraints of a medium-sized business as being good for identifying capabilities differently. He is immensely proud of his people and enjoys developing the best in every one of them. He has had to “unlearn” consulting jargon, of which he admits he was the king! After a period of frequent quizzical looks, he realized that simple terms, explained clearly, would work better in the café industry! These days, he is more often discussing “like for like” performance, than “NPV”, “CAGR” or a “deep dive”! Enjoyment and gratitude play a role in Rupert’s life now. While he admits that his business does take up more than the “one day a week” he likes to pretend, he feels tied to his business and states that his mood and outlook are necessarily linked to the fortunes of Caffe Kix. When asked whether he would return to consulting, his position is unequivocal: while he is happy to share his experience for the benefit of others, through board and advisory roles, he has no interest in going back to the executive world. He has developed great resilience and is clear that the journey of an entrepreneur is one that takes longer than expected, can be lonely, and will not be what you imagined at the outset. A big shift in mindset has helped, letting go of a typical consultant’s tendency towards OCD, by “getting comfortable with being uncomfortable, letting go of some things I would have liked to control, and accepting that a day has been ‘good enough’”. Rupert has clearly engaged fully in his life as an entrepreneur, and if it were not for his sharp intellect, and crystal clear thinking about his industry and position, it would be difficult to imagine that he was ever a part of the corporate world, let alone consulting. Christina Gutenberg also underwent a huge shift in mindset, as she joined one of the largest family-owned companies in Europe, though this was not a change she had particularly expected to make, as her vision of professional life had definitely been one of loyalty to BCG, her firm for the twenty-two years since she first started out in consulting. As a partner, with many high-powered clients, and some fascinating internal roles, Christina was not a likely candidate for exciting consulting, though she had occasionally considered the option but never found a role that was sufficiently attractive to make her consider the jump. She enjoyed the intellectual stimulation and rarefied atmosphere, and the flexible working conditions as well as the interaction with significant leaders across industries and cultures. After a chance encounter with the chairman of this company, she was flattered and surprised to find how attractive it was to be desired for her own unique combination of skills and abilities and to be offered a C-level position. She was also given the chance to make a choice between two different business units and decided to take the more challenging one, in the automobile business, about which she knew little. And thus began a lengthy and admirably complete transition period! Christina read more than thirty books on the industry and quizzed all her former colleagues who had made similar moves out. She took the time to get coaching on both the industry and leadership angles of her new role and ensured that her family and herself were able to settle well in the new location, far from where, or how, they had previously been living. While Christina had had a high-level interaction on exchanging with the company, she did make a common mistake once inside, of assuming that she would continue her privileged relationship with the Chairman. Partners at consulting firms become accustomed to having CEOs and Chairmen on speed dial, and this assumption was embarrassing to Christina when she wrote to the Chairman for advice and guidance, and he very firmly steered her towards her immediate boss! She has quickly learned that as a sector non-expert and an outsider, managing by frequently keeping your mouth shut, and being modest, is a good way to survive. Being an outsider is something Christina has had to get used to, as she is very different in background and makeup to her new colleagues. While this felt uncomfortable at the outset, she now realises that it is an asset, and she can use her difference to get things done, in an environment where speed and dynamism are not what she was used to. The other main challenge Christina has faced is that of entering a company that was actually doing rather well, and did not need “fixing”. Figuring out what she actually can change is an ongoing challenge and one she struggles with occasionally. She has learned to have a short term and long term view of what and how to change, with very different rationales behind them! Although it was difficult to leave BCG after almost a quarter of a century, Christina says that once she had “smelt” the opportunity, she knew there was no way she could stay. However, she did use the BCG philosophy about its alumni to her advantage. “Once a BCG-er, always a BCG-er” is their device, and this has certainly helped her both during her transition out and since she has been in her new operational world. Coaching, references and other information and opinion have been of great value to her all along the way. Her old (and still valid) networks can never be matched by what she builds from here on in, but they are still useful, so she takes advantage of that, however she can. Christina does seek ever-greater opportunities to learn and develop, so while she finds her current challenge sufficiently complex for now, she may well be tempted in other directions subsequently. At this point, she is learning to identify and integrate into the “soul” of her new company and using her difference to affect whatever appropriate change she can. Unlike our previous three subjects, Graham Rich, a British former general practitioner, turned influential change guru in the UK’s health policy, fell into consulting by accident! Although he had done an MBA, incidentally in the same class as Rupert, he had done so in search of self-development and happiness, and not looked with any seriousness at the possibility of becoming a strategy consultant, as so many of his friends at INSEAD had. After a short period managing a team in a healthcare reform think tank in the US during the Clinton administration, and where he got his early experience of significant research and paper-writing, Graham followed his wife to Boston, where she was to study, and he wished to find work. What better employer than the Boston Consulting Group? A self-confessed “non-Dean’s List” character, Graham had not envisaged this possibility, but was encouraged to join by an enthusiastic and supportive senior partner, and was immediately heartened to find himself in the healthcare practice, surrounded by driven, energetic and international colleagues, all doing interesting things. What was harder for him was to find himself back at the bottom of the pile, carrying out analyst tasks, when he actually knew and had good relationships with many of the CEOs in US healthcare, both current and non-clients! He found himself on a variety of projects, many of global scale, and fell quickly into a frenzied routine of travel all week, every week. As he describes it, there was one weekend in which all of Graham’s ideas crystallized. He and Sarah, his wife, had travelled from East to West Coast for a two-day BCG healthcare conference, from which they got home at 1 am on Monday morning. Four hours later, Graham was on the way to the airport, to attend client meetings in Germany. When he returned two days later, and his wife, who was pregnant at the time, told him that she still felt tired from the weekend, he realized what an absurd feat he had just accomplished and seriously questioned his sanity! With this uppermost in his mind, he realized that he wanted a “proper” job again, with a more reasonable lifestyle, but also budgets, staff and implementation! A return to the UK seemed logical, at this point, and into a role in the National Health Service which came up, as CEO of a region of the country. The change was, as Graham describes it, “like going from flying to landing in treacle, and then learning to swim!” Nevertheless, he got a great deal done, and moved on to a second role, as COO and then CEO of a large teaching hospital. Once again, the alumni network management of these consulting giants came into play, and his former colleagues at BCG invited Graham to rejoin, to co-lead a new initiative, fourteen years after he had first joined! At that point, he refused, saying he was still very happy introducing all kinds of new policies and actions and living a manageable lifestyle to boot! However, six months later, he had fallen out with his Chairman and tentatively asked if the offer might still be open… BCG welcomed Graham with open arms and allowed him to negotiate his own terms. He is no longer part of the consulting hierarchy, and acts, in his words, “as a partner-like buddy”. He does not work more than half-time for BCG and has just recently shifted his status to self-employed. In this way, Graham manages to keep the aspects that are important to him, such as business building and “seeing things through”. Graham has entered, as he puts it, “serious portfolio career territory”, now holding several non-executive directorships, and has learnt to be happy with whatever he is doing at the current moment. Unlike some of our other subjects, he has no clearly mapped out a plan for the future but feels confident it will be a good one. He has a clear set of criteria for new opportunities, which he shamelessly imposes on whatever might come up, so he knows that he can make good choices from now on. He also has a simple attitude to the less attractive aspects of his past career, and a strategy about how to avoid these in the future. Suffice to say he will be spending more time with his family and on good health, and less on impressing others and being overly competitive! While we have talked about four successful and happy “former” consultants, it is worth noting that many consultants never make the transition, and in some cases, the failures have been significant and painful. We know of an example, whereby a senior partner from a very prominent strategy consultancy joined a large pharmaceutical company, as Head of Strategic Planning, reporting directly to the CEO. Within a short time after joining, he had launched a series of initiatives, creating confusion and chaos in an organization that was already riddled with complexity. He demonstrated very few skills in communication or empathy, and thus alienated the majority of his team and peers, and did not endear himself to the CEO either. To top it all, ironically, he ended up dramatically increasing the spending on external consulting, which was, of course, the opposite of the intended effect. By this time, the CEO had lost patience and asked him to leave. He has since returned to the world of consulting, but this time on his own. His debacle is still remembered vividly, fifteen years later, with a mix of horror and humor, by those inside the healthcare company and we can only imagine that the episode does not figure in the most glorious moments of the consultant’s life either. Not all of those cut out for great careers in consulting are destined for equal success out in the “real world”! Our four main stories amply demonstrate success in this kind of consultant to C-level executive transition. We have shown you four very different individuals, navigating in and out with confidence, and very clear ideas of what their future looks like, however, defined it might or might not be in the detail. There is not enough science in this area for much absolute conclusion… However, what we do know is that a certain proportion of former consultants positively thrive on this kind of liberating transition out, and some of them even manage to re-create that kind of freedom when re-entering the world of consulting. What we know less about is the kind of character that will or will not succeed in this area. It is too early to tell on this front. 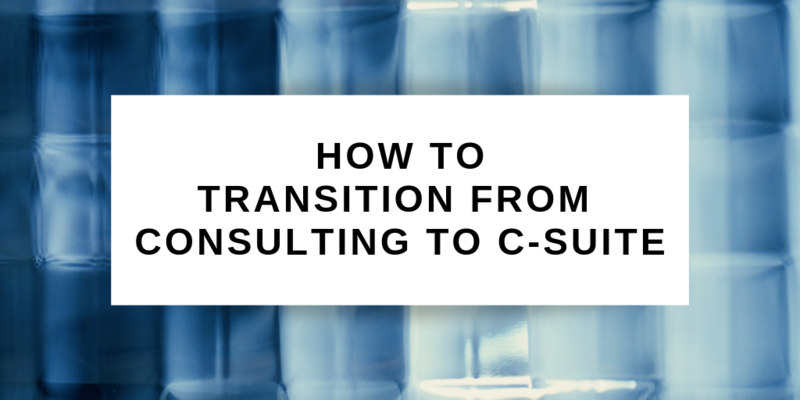 There are many mistakes that a high-level consultant can make on transitioning into operational roles, and the more these can be understood and anticipated before making the transition, the more likely it will be a success. Claire Harbour-Lyell is a global talent expert and coach, who supports those planning or undergoing significant career transitions. She loves to help consultants to make their move “out”, and to support them as they plan, implement and settle into their next move. Antoine Tirard is a talent management advisor and the founder of NexTalent. He is the former head of talent management of Novartis and LVMH. This article was also published on INSEAD Knowledge.